We had company over for spaghetti and meatballs last night. Brian, Judy and her mom came over for supper and some cards afterwards. Chris out did herself as usual on the main course and Judy’s dessert was awesome. The best part was we had enough leftovers for supper today as well! We started off today with a brisk 3 mile walk around the campground before breakfast. Barb & Dennis arrived in from Catalina Spa by mid morning and took site 315 next to us. The girls spent the afternoon outside beading while I sort of watched the NFL football conference playoffs. Green Bay managed to sneak past the Chicago Bears and it looks like Pittsburgh Steelers will dispose of the NY Jets., setting up a Packers vs Steelers Superbowl final. I say I sort of watched because I was actually working on my Photoshop CS5 and Lightroom 3 skills while the game was on in the background. I’m still in the learning phase of both software programs but thanks to the lessons available at NAPP things are progressing nicely. Its amazing how much these programs let you do to photographs. I went back through some photos from our time in Louisiana & Mississippi last spring while on our way to the Tiffin factory in Red Bay. 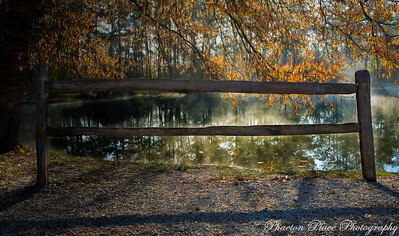 The fence railing photo was taken at sunrise in Abita Springs last March. 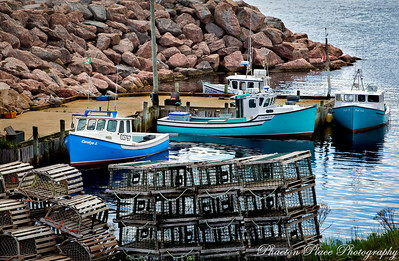 The lobster boats and traps was taken during our tour of Cape Breton National Park last June. 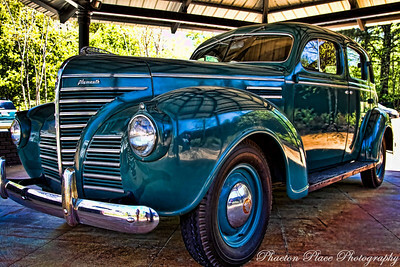 The old Plymouth was on display at Elvis’s birthplace in Tupelo, Missisippi last March. This entry was posted in Campgrounds, Entertainment, Photography, Photoshop, Thousand Trails. Great shots. I really like the one of the fence. I am with Sue and Doug-love the boat picture. great photos as always! !…love the lobster boats! !